In Andalusia A S. W. Province Of Spain, bordering on Bada-joz, Cordova, Malaga, Cadiz, and Huelva; area, 5,295 sq. m.; pop. in 1870, 515,011. The northern portion is traversed by the Sierra Morena, and the southern by the Sierra Ronda, with some peaks of considerable elevation; the remainder of the province mainly consists of vast and fertile plains, drained by the Guadalquivir and its tributaries, the largest of which are the Genii, Viar, and Huelva. The climate is extremely hot in summer, but very salubrious. Agriculture is well advanced, and the vine and olive are particularly abundant. There are large numbers of cattle, horses of superior breed, mules, sheep, goats, and swine. Among the mineral products are silver, iron, copper, and lead, with coal, marble, and limestone. Wines and oil of superior quality are produced; and there are manufactories, chiefly at the capital, of silk, woollen, and linen fabrics, soap, leather, brandy, hats, porcelain, common earthenware, leather, etc. The principal town besides the capital is Ecija. A City (Anc. Hispalis), capital of the province and of Andalusia, on the left bank of the Guadalquivir, 62 m. N. N. E. of Cadiz, and 242 m. S. W. of Madrid; pop. (including its seven suburbs) about 115,000. It is situated in a delightful plain, and surrounded by Moorish walls with 66 towers and 14 gates. In 1864 it had 564 streets, mostly narrow and tortuous, but well lighted, and 62 public squares. Many of the houses are remarkable for architectural beauty, and have magnificent colonnades and courtyards, paved with porcelain tiles or marble and embellished with fountains. The cathedral, one of the largest and finest in Spain, exquisitely decorated within and without, was completed in 1519, on the site successively occupied by the temples of Astarte and Salambo, and the ancient mosque of Seville. Although repeatedly despoiled, it still contains some of its finest pictures by Murillo and other masters. The main tower, the Giralda, erected in 1196 as the chief muezzin tower of the ancient mosque, was at first but 250 ft. high; but in 1568 was added a superb filigree belfry surmounted by a bronze figure of "Faith," and the present height is about 350 ft. The cathedral has one of the largest organs in the world, and contains the tombs of St. Ferdinand, who conquered the city from the Moors, Queen Beatrice his first wife, Alfonso the Wise, and other celebrities. Attached to the sagrario or parish church, contiguous to the cathedral, is a library of about 18,000 volumes, the gift of Fernando Columbus, the son of Christopher, and containing several manuscripts by him and his father. The city has a large number of other parish churches, chapels, convents, and nunneries. The benevolent institutions are also numerous. Among the other edifices of note are the alcázar or Moorish castle, in many respects equal to the Alhambra of Granada; the archiepisco-pal palace; the casa de Pilato, so called from a reputed resemblance to Pontius Pilate's house at Jerusalem, and now the palace of the duke of Medina-Celi; the city hall and other government buildings; the court house, mint, exchange, custom house, and tobacco factory. The torre de oro or tower of gold, long the storehouse for the treasures from America, is said to have been built by the Romans. The bull ring, commenced in 1760, but still unfinished, accommodates 11,000 spectators. The university, founded in the beginning of the 16th century, has a good collection of pictures and sculptures, museums of chemistry, physics, mineralogy, and zoölogy, and a botanical garden. 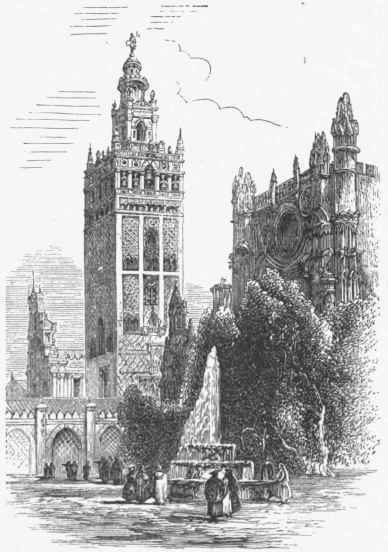 Seville has also a school of fine arts, colleges of law, medicine, and commerce, a nautical academy, and a large number of other schools, many of which are for females alone. In the grand tobacco factory are employed 3,000 women, chiefly from the Canaries, and 600 men; and brass cannon, small firearms, saltpetre, and gunpowder are made in the ordnance foundery. Seville formerly carried on a large portion of the trade with the new world. This business was in the early part of the 18th century transferred to Cadiz in consequence of the silting up of the Guadalquivir, which rendered it unnavigable by vessels of over 100 tons. The staple articles of export are oil, oranges, wine, silk, leather, quicksilver, copper, and lead. - Seville was called Sephela by the Phoenicians, Hispalis by the Romans, and Ishbiliah by the Moors. It was captured in 45 B. C. by Julius Caesar, who made it a Roman colony, patronizing it in opposition to Cordova, which had espoused the cause of Pompey. When the Goths invaded the country they made it their seat of power, but in the 6th century the court was removed to Toledo. It was in the hands of the Moors from 711 till 1248, and under them attained great splendor, and a population of 300,000. In 1248 Ferdinand III. of Castile and Leon took it after a long siege, and made it the capital of those united kingdoms, which it remained until the reign of Charles V. A treaty was concluded at Seville in 1729 between Spain, France, and England. The city surrendered to the French under Soult in 1810, when the inhabitants were cruelly treated, the plunder and money extorted from them being estimated at $30,000,000. They evacuated it in August, 1812, when the English entered the town. It was besieged by Espartero in July, 1843. 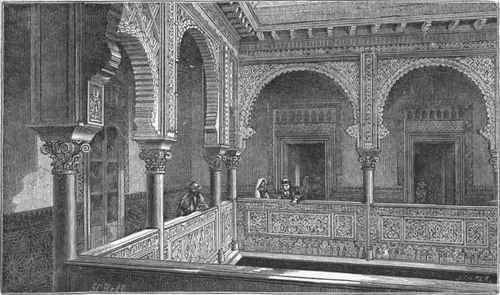 Interior of the Alcázar of Seville.